The first is related to Spanish banks. The Advocate-General of the European Court of Justice (ECJ) opined today that Spain could impose a time limit on claims of unfair mortgage terms. If the ECJ concurs with the Advocate General as is frequently the case, Spanish banks may avoid refunding potentially billions of euros to a customer who paid too much for mortgages. Spain had mortgage rate floors that prevented borrowing costs from falling in line with key benchmark rates. In May 2013, Spain's Supreme Court ruled that such rate floors were illegal. In April a Spanish court ruled that around 40 lenders had to refund borrowers the extra interest they paid since the May 2013 judicial decision. The bottom line is that ruling if upheld, will save Spanish banks billions of euros. BBVA appears to have been the most exposed, according to reports, estimated to be nearly two bln euros in retroactive payments. Banco Popular and CaixaBank also appear to have significant exposure. Their stock prices responded favorably to the unexpected decision. The second development involves Spanish politics. |It appears that Rajoy, whose PP did a bit better in the June election compared with December, is getting closer to securing another term. 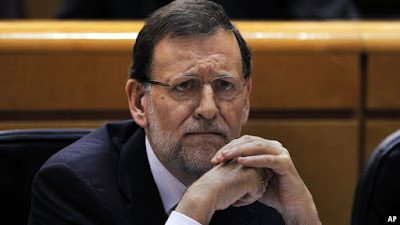 The latest development was a signal by the Ciudadanos head Rivera that the party could be willing to abstain in a confidence vote, which would allow for a minority government. Ciudadanos ruled out entering a coalition with Rajoy. It seems clear that the EC is trying to balance the importance of the rules and recognizing the efforts that both countries have made in recent years. There also seems to be recognition that several other countries are in similar position. Also, the EC recognizes with the Brexit vote, the integration of Europe has been challenged. It does not want to take action that will aggravate the situation. Many also will recall how Germany and France dodged a similar problem several years ago and were not fined. We anticipate the EC to ultimately decide on symbolic action. The EC does not want to appear as a harsh taskmaster, but an ally in coordinating policy and getting the fiscal houses in order, which not-so-incidentally appears to be a prerequisite for German agreement for more burden sharing. The EC has no interest in sabotaging the fragile Portuguese recovery or undermining the stronger Spanish recovery.